Benefit from a complete solution from a single source! Watch the 2 minutes explanatory video! Based on the Vector Controllers, the entire project for your series vehicle can also be covered by Vector. It starts with the definition of features, through the implementation process up to the maintenance in series production. Upon that, we rely on the high quality and standards of the automotive industry for small series productions. The Vector Controller - Vehicle Charge Control Unit (VC-VCCU) is a generic charging control unit. With its integrated functionality for charging via Powerline Communication (PLC), it provides the perfect interface for prototype vehicles and development environments per DIN SPEC 70121 and ISO 15118. It can also be carried over into your series vehicle right away. VC-VCCU: Perfect interface for prototype vehicles and development environments according to DIN SPEC 70121 and ISO/IEC 15118. 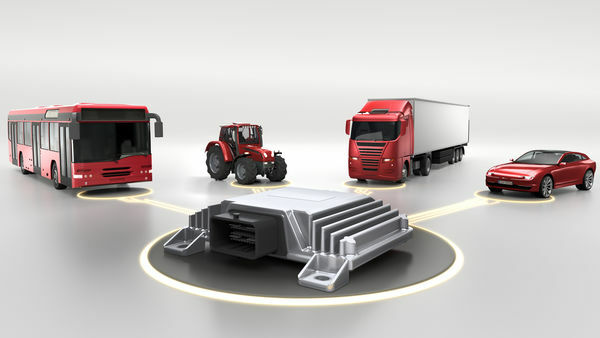 The executed CAN channel with the standardized J1939 high-level communications for the commercial vehicle market provides a fast connection to the vehicle. The diagnostic messages for DM1, DM13 as well as the J1939 network management are supported. This graphic shows the recommended integration into the vehicle. In conjunction with the AUTOSAR basic software, AC and DC charging according to IEC 61851, DIN SPEC 70121 and ISO 15118 is supported. Integrated MICROSAR 4.2.1 software architecture with the used basic software components and the generic application as well as the function library for intelligent charging. Based on its many communication and IO interfaces, the universal ECU VC121-12 is the ideal solution for use in small series productions and for rapid development of functional samples. It is also well-suited for use in evaluation projects and test fleets. Vector’s AUTOSAR basic software MICROSAR is available in the VC121-12 also for Evaluation Purposes (see Tab “Evaluation Bundle”). It forms the basis for your application and contains supplemental hardware drivers that are not specified in AUTOSAR, such as for controlling output driver chips. The VC121-12 is fully qualified for serial production in accordance with ISO 16750 / LV 124. That’s why the use in serial productions after evaluation is just a small step. To reduce costs for series production, it is possible to procure the ECUs with reduced PCB population. The right accessories will help you in development. You will find detailed notes of the VCA0101 in the user manual. The VCA0201 JTAG adapter is used to connect the VC121-12 to debuggers or programming hardware. The adapter is plugged onto the Nexus 38+ interface of the VC121-12 and offers the standardized 14-pin connector for a JTAG interface that is used as a counterpart. You will find detailed notes of the VCA0201 in the user manual. The integrated VCA0301 debugger enables debugging of the ECU software using the supplied winIDEA software from iSYSTEM. The VCA0301 is plugged directly onto the debug interface of the VC121-12 and establishes a JTAG connection to the microcontroller. The compact layout makes it possible to use the debugger in an enclosed ECU housing and offers a direct USB connection to a PC via a built-in socket on the outside of the ECU (VCA0602). Product includes a 12-month license for debugging the ECU software using winIDEA – the debugging and test software from iSYSTEM. You will find detailed notes of the VCA0301 in the user manual. You will find detailed notes of the VCA0401 in the user manual. You will find detailed notes of the VCA0501 in the user manual. The VCA0601 housing variant is available for the VC121-12 and gives you easy access to a wide variety of interfaces without having to constantly open the ECU housing. It enables easy connection of devices like the VCA0201 JTAG adapter or the integrated VCA0301 debugger to the microcontroller. You will find detailed notes of the VCA0601 in the user manual. The VCA0602 housing variant is available for the VC121-12. The integrated Mini-USB socket gives you easy access to the VCA0301 debugger while the ECU is still fully protected. You will find detailed notes of the VCA0602 in the user manual. The Evaluation Bundle for the VC121-12 features a production quality MICROSAR 4.2.1 basic software perfectly suited for the ECU. Besides the required embedded software components and the operating system it contains software tools to configure the basic software as well as all drivers to control the interfaces of the ECU. The VC36B-12 is an Ethernet gateway with switching functionality. With five BroadR-Reach (100BASE-T1), one 100BASE-TX channel, one CAN-HS / three CAN-FD channels and one LIN master channel it is well-suited for many gateway applications and backbone architectures. It is also appropriate as information highway and driver assistance (ADAS-) controller in the vehicle. The ECU is perfectly suited for functional evaluation and use in test vehicles. The IP protection class is IP40. Together with the separately available AUTOSAR basic software MICROSAR 4, the VC36B-12 is the flexible solution for your use case. It is possible to realize series production with the VC36B-12 in a customer specific development project. For evaluation and test purposes, we offer a complete evaluation bundle. The development of small series productions is no less time consuming than development of large series. Due to the small quantities involved, costs play an even greater and more sensitive role. At the same time, the quality must meet your standards. With Vector you have a competent and reliable partner that will implement small production run projects together with you. The development of small production runs is no less time consuming than development of large series. Due to the small quantities involved, costs play an even greater and more sensitive role. At the same time, the quality must meet your standards. With Vector you have a competent and reliable partner that will implement small production run projects together with you. On the basis of the VC family, we create your complete ECU project for small and midget production runs, ranging from the requirements analysis and implementation to series production support. The VC family provides a variety of communication interfaces such as CAN, LIN, FlexRay, Ethernet, and Power Line Charging for eMobility according to ISO 15118 as well as support of various sensor buses and load drivers. For this reason, it is an ideal basis for gateway applications, domain controllers and special functions. You can use all available Vector controllers directly for commissioning this project. The individual hardware function blocks offer a wide range of application, scalability, and a high level of reuse. Does our existing portfolio fail to meet your requirements? On the basis of the VC family, we create customized ECU to your exact specifications. High quality must also be met for small and midget production runs. The Vector Process Management System (VPMS) is an ISO9001:2008 certified process. It guarantees a uniform workflow across all projects and ensures its quality. The Quality Management, which is independent of the project, checks the progress of the project during software and hardware development in order to guarantee the maximum possible quality standard. If necessary, the process can be adapted to your specific requirements, thereby providing maximum flexibility. An efficient system requires precise planning, specification, and design. This is a major component of our expertise. Our experts rely on their many years of experience to make optimal decisions for you. The system is based on an ECU of the VC platform. Our experts use their very detailed knowledge to give you the ideal ECU for your application with the required functionality in a short amount of time. Upon request we are happy to specify and develop the application for your individual requirements. Model-based development of your application is also possible. Special attention is paid in every ECU project to the integration of the standard software on the respective ECU. Our many years of experience have made us a strong partner in assisting you with this. Starting with the ECU-specific communication databases and diagnostic descriptions as well as the integration of the Flash bootloader to the partial or complete application integration and development. You can fully rely on our engineers for this. To ensure error-free operation, we test the integrated component interfaces against one another. This is done firstly on the software side. Secondly the interface to the ECU hardware is tested in detail. Not just the components among themselves that have to be tested for high-quality software. Rather, the functionality of the overall system must also be tested. We conduct the prequalification of the ECUs in our in-house labs. Function tests are performed based on an agreed-upon specification. Communication is tested based on CANoe. Diagnostics is tested with CANoe.DiVa. The VT System is used to check the hardware interfaces. Other test options include service life simulation facilities, climatic chambers, and load attachments. We conduct the series qualification in an accredited, external test lab. We document the system that is successfully validated and released for the series according to your requirements. We deliver this to you as an initial functional model or for the series depending on the desired stage. The delivery takes place from Vector or our EMS service partner. Alternatively, you are welcome to use your preferred ECU supplier. Vector provides you with series production support even after series start-up. This includes the monitoring of utilized components and any discontinuation announcements and related new production data sets. Starting from the first step, we take over the project management in accordance with standardized guidelines and in compliance with your wishes. We draw up the project plan and define the range of functions in close cooperation with you. Regular coordination rounds ensure the correct execution of the project. In addition to the ECU hardware, you also need tailor-made embedded software? In order to provide you with an overview of the various applications of the VC ECUs from Vector, we have compiled a selection of projects which have already been successfully implemented.